The third article in my series on photographic composition. In this, my third article on photographic composition, I'll be discussing the importance of 'emotion' and hopefully I'll be able to give you some practical ideas for ways in which you can address the difficult issue of how to convey your feelings through your photography. If you are reading this article then you already have a deep interest and passion for photography so I'm going to assume that you know all about the great American landscape photographer Ansel Adams. In 1983, the year before Adams died, he was interviewed by the BBC for a series they were producing called 'Master Photographers'. Due to the difficulty that I had trying to read his technically complex books describing the Zone System I had never really understood Ansel's approach to photography but in this BBC interview he makes his approach crystal clear. Ansel Adams was best known for his wonderful b&w photography and toward the start of the interview he describes some of the techniques that he uses when processing his photos in order to better convey the feelings he had for the subject. For myself, the reason that I enjoy b&w photography so much is that I feel it is better suited than colour for conveying my feelings about the subjects of my photos. The methods that I use in the digital post processing of my photos to help convey emotion are basically the same as the ones that Ansel Adams describes in his interview where he talks about manipulating the tones during the dark room print processing to get more impact. The way in which the spread of tones throughout the image is handled is critical to the success of b&w photographs and as a photographer you need to take control of the tones in the image in order to best present to the viewer your feelings for the subject. Of course, each photo needs individual treatment and there is no blanket formula for producing strong images but an example of one way in which the drama of a scene can be conveyed to the viewer is by careful control over contrast in the image and in the overall balance between light and dark. Part of this control will come from your initial framing of the image in the camera's viewfinder and part will come from the way in which you handle it's post processing - in other words what you feel about it. The photo of Fiddlers Ferry power station below is a good example. 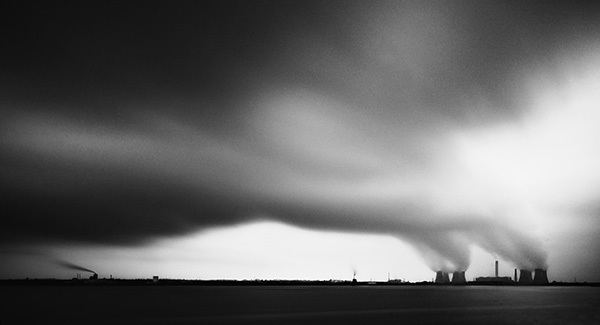 The drama in the original scene for me was in the immense cloud of water vapour coming from the power station's cooling towers which had combined with a storm front to obscure the clear sky beyond and I framed the scene accordingly to capture this as best I could. 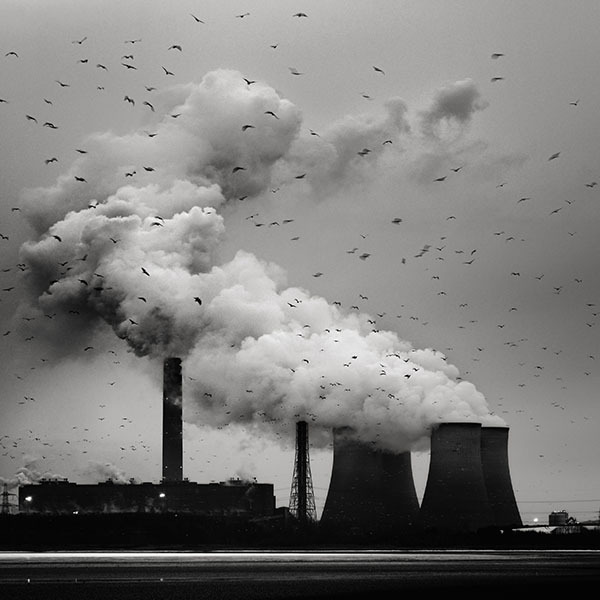 The smaller factory on the far left was deliberately included in the frame to help give a sense of the huge scale of the main power plant and of the looming sky. I also used a neutral density filter over the lens so I could get a long exposure time which removed any distractions from this central theme - things such as movement in the foreground water and birds in the sky. In post processing I emphasised the drama in the sky by cropping away some of the foreground and by increasing the contrast in the photo to emphasise the oppressive quality of the cloud. Once you start to become more conscious of the effects that high contrast can have in b&w photography you will learn that it can sometimes be achieved quite easily in-camera by photographing scenes where the high contrast occurs naturally. 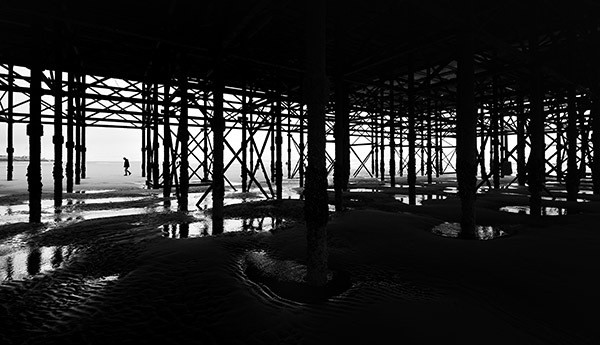 The photo below was taken in the deep shadows under a pier on the beach at Blackpool and has had very little post processing - I saw it as a forest of metal columns and beams. I waited for a person to walk into the gap in the structure to add a sense of scale, to give a focal point to the image and because I wanted that visual and emotional contrast between the small person and the huge dramatic structure. Consciously placing the dark silhouette of the person in the brightness of the clearing in the forest of the structure really added to the drama and impact of the photo. Hopefully, if you are a beginner to photography or have been struggling with the composition of your photos, this article will have helped you on the road to making improvements that will bring you greater enjoyment from your photography. My next blog article will cover the importance of 'light and form'.